After being dismissed from jury duty in Downtown on a recent afternoon, I was getting hungry, and began making my way down to South Central. My destination was the USC-adjacent Mercado La Paloma, as I finally had an opportunity to check out Holbox, a mariscos joint from Chef Gilberto Cetina, Jr. The story of Holbox has to start with another Gilberto Cetina, the younger Cetina's father. Cetina Sr. came up in Tizimín, Yucatán, not far from Chichen Itza. He learned cooking from his mother (she had a restaurant), and was also trained as a civil engineer. He first came to the US in 1979, but after a couple years, moved back to Mexico. In 1986, Cetina returned, this time staying longer and getting a feel for the culinary scene, but once again went back to Cancún to work as an engineer. He moved here for good in 1997, and in February 2001, opened Chichen Itza as the first food vendor at the then-new Mercado la Paloma. 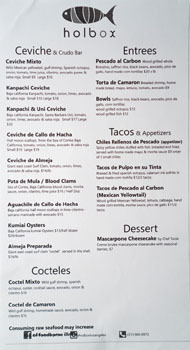 The Yucatán-inspired restaurant was well-received, and in 2006, the team launched another location in Westlake, but that outpost ended up closing in 2009. Junior, meanwhile, was also born in Yucatán. He was working toward a career in the computer industry, but after Chichen Itza started, decided to join the family business. He cooked and learned alongside his father, and in 2010, took over day-to-day operation of the restaurant. 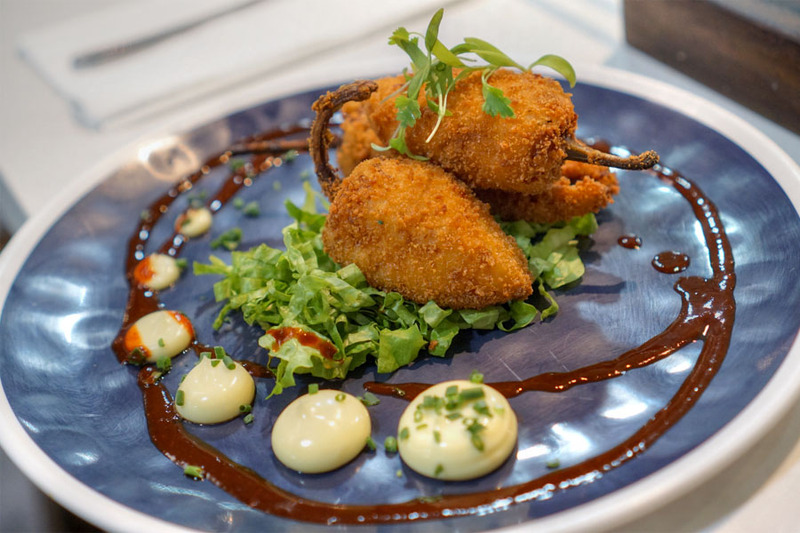 In February 2017, Cetina Jr. opened Holbox, a seafood-centric affair named after an island off the coast of the Yucatán Peninsula. The family used to vacation there during the Chef's teenage years, and his experiences on the isle form the ostensible inspiration for this venture. 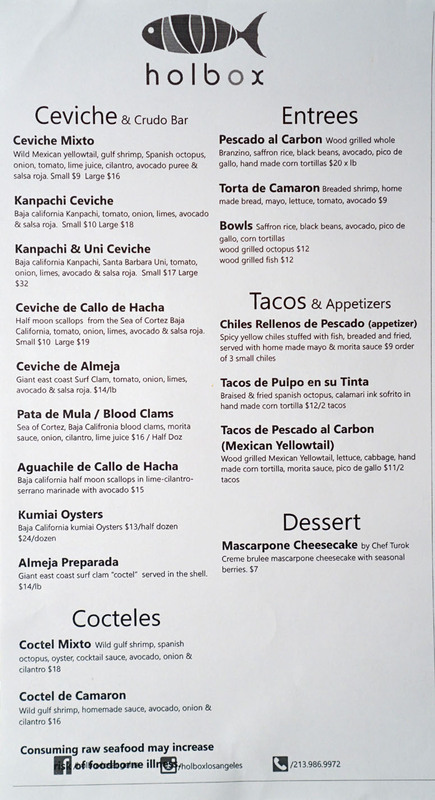 The menu takes inspiration from multiple parts of Mexico, offering up a selection of both raw and cooked items that changes (in small ways) daily. Take-out is an option, as is delivery apparently, and there's even a tasting menu (six courses at $55, reservations required) available Thursday through Saturday. As far as drinks go, there's not much to speak of, and alcohol is definitely not served. Click for a larger version. 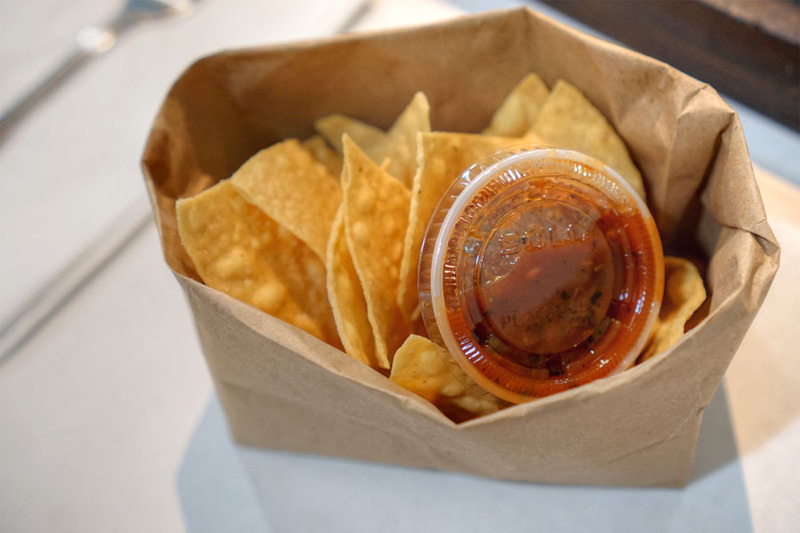 Upon being seated, I was quickly given a complementary serving of chips, paired with a smoky, earthy salsa. 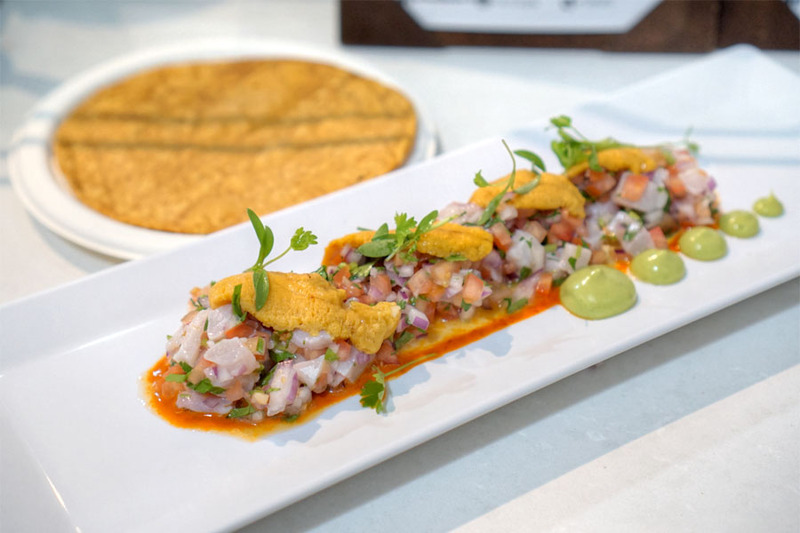 It just felt proper to begin with a ceviche, and this one was right on the money with its firm, meaty cuts of amberjack matched by a bevy of zesty, acidic flavors and a noticeable heat. The sea urchin was just icing on the cake, adding an enveloping richness to the mix. Octopus legs came out super tender, their subdued flavors enhanced to great effect by the depth and salinity of that tinta-infused sofrito. I appreciated the counterpoint provided by the greenery, while the tortillas were hearty, substantial, and the perfect vessel for consumption. My only quibble was that I would've liked a harder char on the octo. The aguachile verde was a must try by my estimation, and didn't let me down. 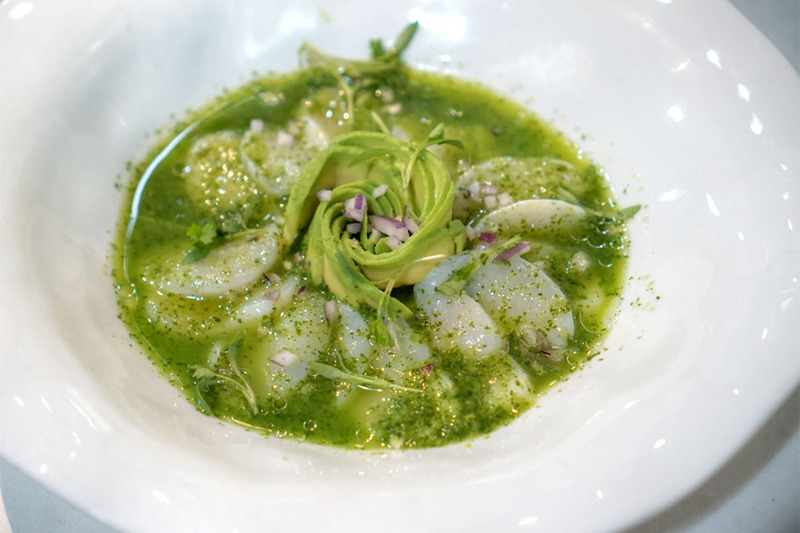 Supple, substantial cuts of scallop were joined by a blast of bright, zippy flavors that complemented the shellfish without overwhelming it, and I appreciated the additional lushness imparted by the slivers of avocado in the middle. 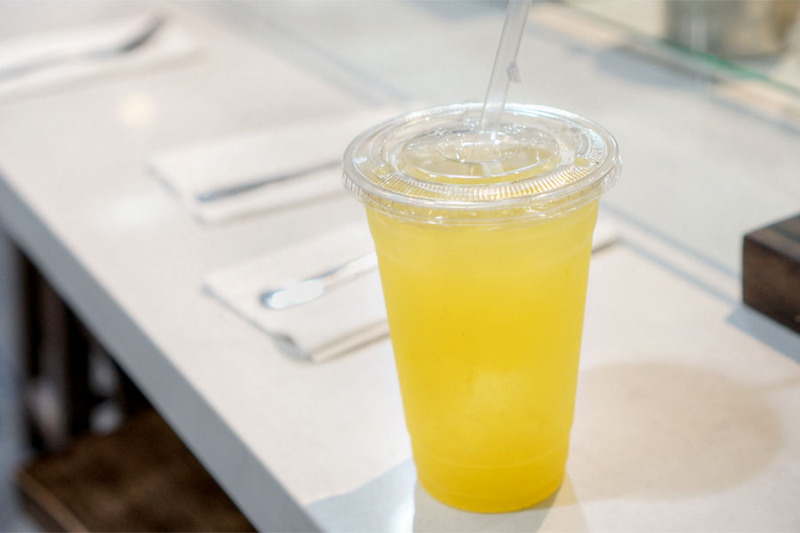 To drink: the house lemonade, which was just sour enough, with a sweetness lurking in the background. Cetina's version of the classic chile relleno delivered big time. I was definitely into the chilies' briny, savory, juicy stuffing, and how that worked as a contrast to their light, crisp exteriors. A morita sauce added a touch of smoke to things, and even better was that tangy housemade mayo. 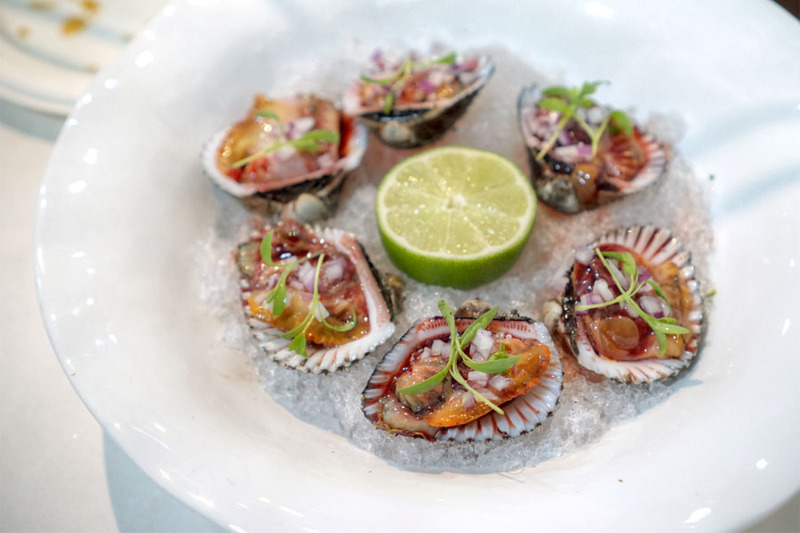 Firm, springy cuts of surf clam arrived in coctel form, the sweet 'n' sour nature of the ketchup-based sauce making sense with the almeja's natural salinity. Herbs added a welcomed lightness to the dish, and I got a nice heat on the finish, too. 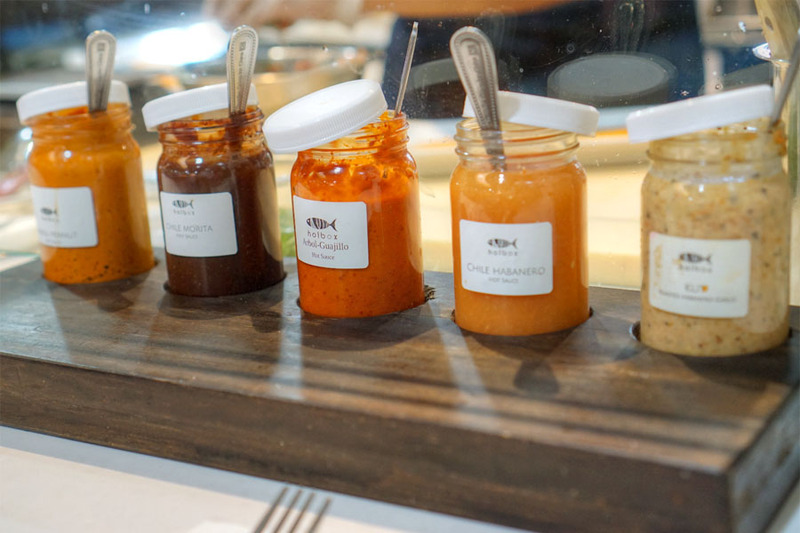 There were a number of homemade condiments available for use, though I really didn't find them necessary. We ended with probably the most unique item available, as you rarely see blood clams offered on menus. 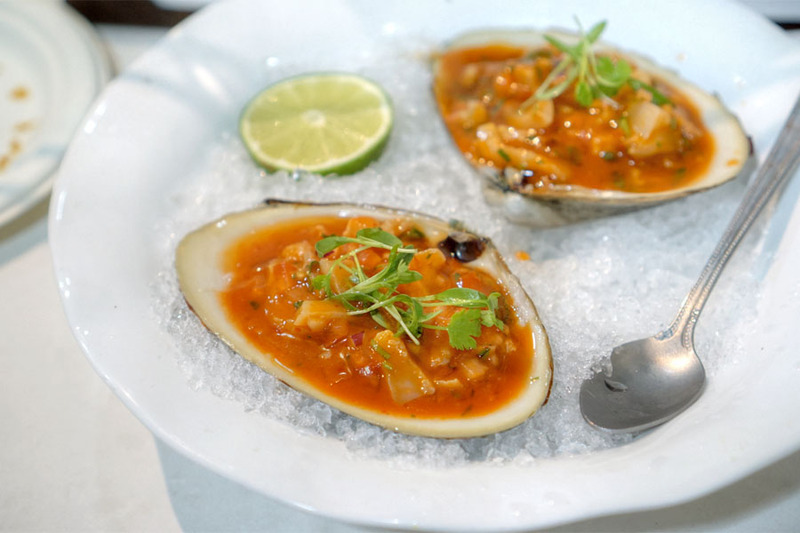 I loved their sort of multifaceted texture and crunch, while flavors were definitely briny, but with an intriguing astringency and almost "bloody" minerality, all evened out by the application of the clams' various accompaniments. As expected, I thoroughly enjoyed my time at Holbox. The food was pretty much spot on, and you could certainly taste the quality of the product used, which was a cut above the norm for sure. I think it's safe to say that this is certainly one of the premier mariscos places in the Southland, if not the premier. $12 for two tacos? I cannot support this dining establishment. Bet you had a much better lunch than most people in the jury pool had that day. 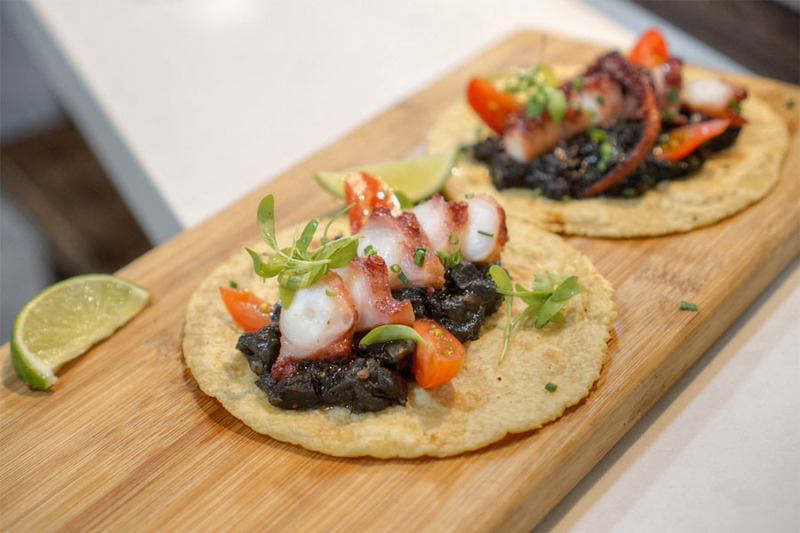 Why is it ok for an Italian restaurant to charge $12 for a grilled octopus appetizer, but not ok for a Mexican restaurant to charge $12 for two grilled octopus tacos? same amount of octopus. Is it that Mexican food should be cheaper? just because it's Mexican.